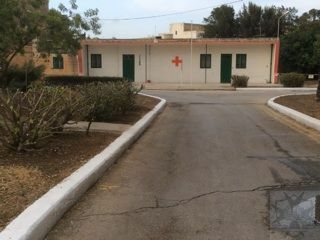 Luqa 2 site Sick Quarters or NAAFI? Although this photo shows clearly a Sick Quarters I am not sure this wasn't the NAAFI in 1973; any ideas? Still fascinated by all these photos of 2 Site. Using Google Maps co-ordinates, are you able to post a screen-grab showing where you took this photo? I can't identify this building which appears to be square-on to the end of a road. I recall the NAAFI being a small building and I would say it is at Google co-ordinates 35.852334,14.49082.